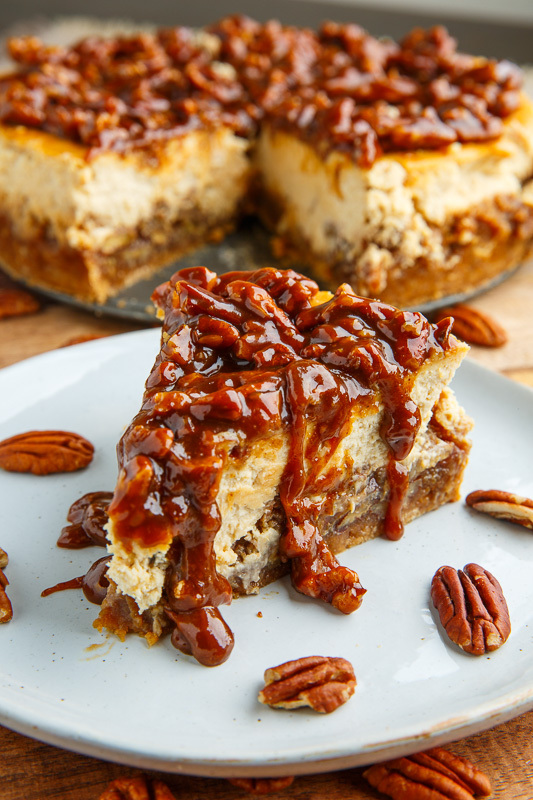 A pecan pie topped with a cheesecake topped with a pecan caramel sauce! 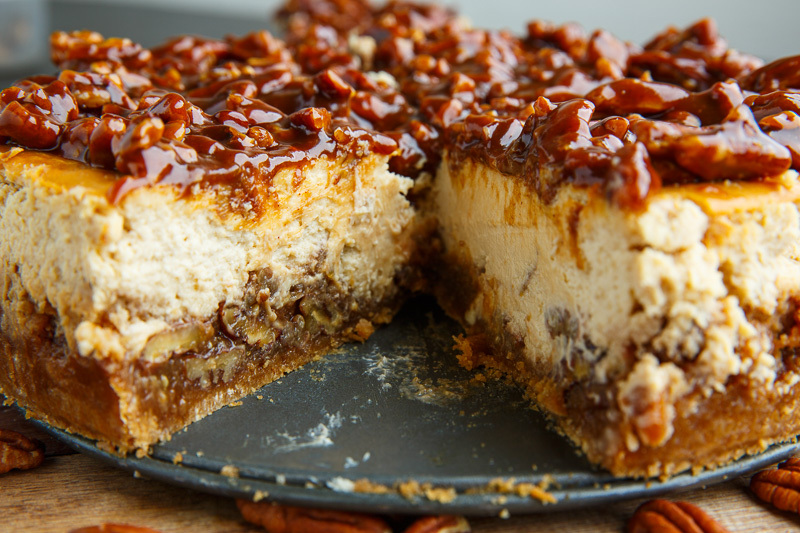 Pecan pie and cheesecake are two of my all time favourite desserts (especially for Thanksgiving) and combining the two makes things even better! 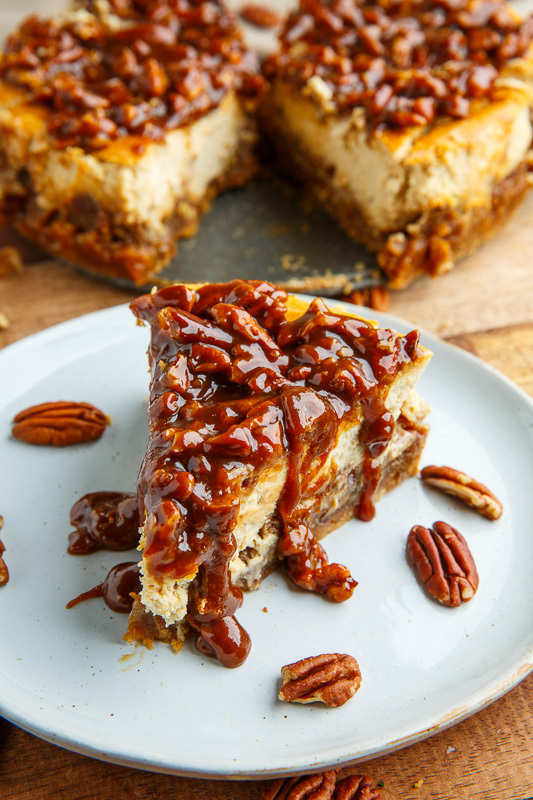 This decadent treat starts out with the pecan pie filling which is simmered on the stove top until it thickens before pouring it into the crust in a springform pan. Next up is the cheesecake layer which is a pretty basic cheesecake recipe using brown sugar instead of regular sugar which goes with the flavours of pecan pie. The whole thing is baked until both layers are set before cooling and enjoying! 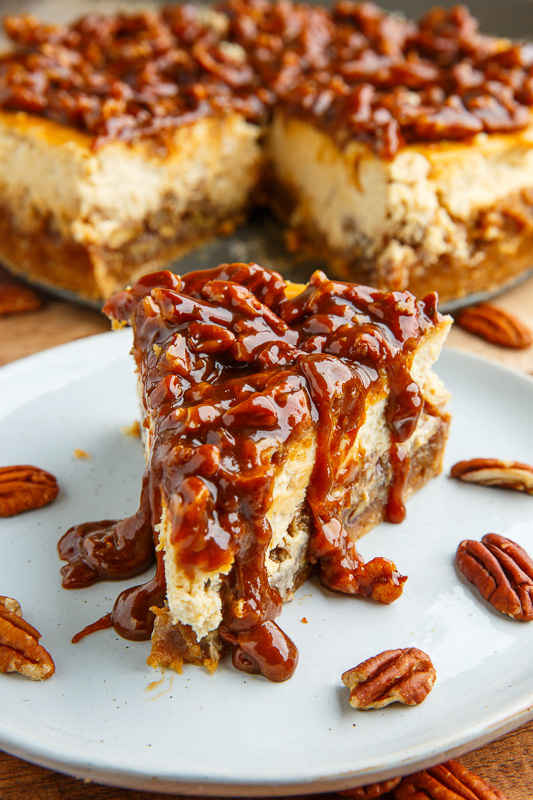 This two layer cake of pure magical delight is amazing all by itself but why stop there when you can top it all off with a simple pecan caramel sauce? 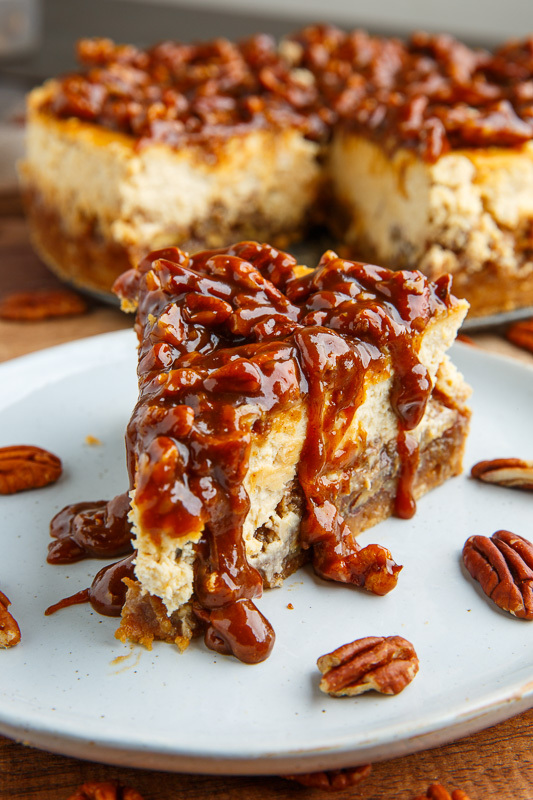 This pecan pie cheesecake with pecan caramel sauce is easy to make and perfect for any special occasion, holiday dinner or any time at all! 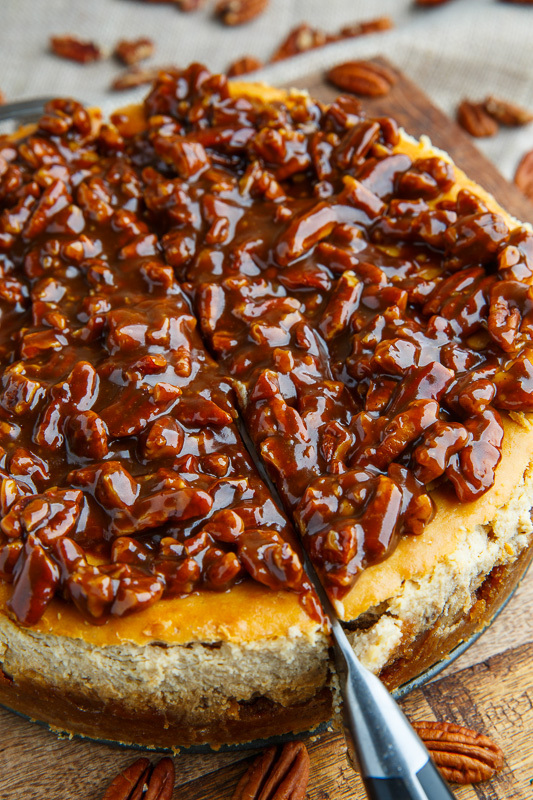 Mix the brown sugar, maple syrup, butter, eggs, vanilla and pecans, bring to a simmer over medium heat in a sauce pan and cook until it thickens, about 5 minutes, before pouring into the crust in the springform pan. 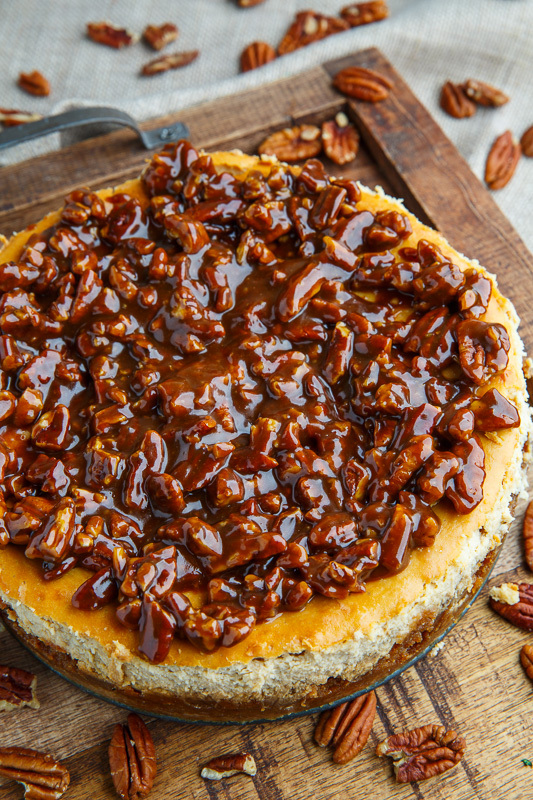 Heat the butter and sugar in a small sauce pan over medium heat until bubbling, let it bubble for 3 minutes, carefully add the heavy cream, mix until smooth and add the cinnamon and pecans and let cool before pouring on the cooled cheesecake. Was looking for a dessert to go with my Christmas beef wellington and I think this might just beat out the sticky toffee pudding I was going to do. I don't have much experience with baked cheese cake but this looks so good and the intructions easy to follow even if I do mess up at the very least I'll have real fancy pudding. Thanks. It sounds like the eggs may have cooked, scrambled style, due to high temperature. I have updated the recipe to specify the temperature for cooking the pecan pie filling. It will still be a liquid when pouring it into the crust but it should be a thick liquid. I made this today, Sunday. Will it keep in the fridge until Thursday? I made this for Thanksgiving, and it was a hit. My pecan bottom was a bit runny, not sure what I did wrong there, but tasted great. I live in a higher altitude, would that affect the cheesecake cooking at all? I’m glad you like it! Did the pecan sauce thicken in the sauce pan before you placed it into the crust or was it still pretty runny then as well? Hello! Will the topping get hard and solid while cooling or Will it remain like a sauce? The topping will remain soft but not too runny at room temperature and it will be pretty solid if you chill in the fridge. Enjoy!